What are you thankful for? We usually ask that question in November, and here it is June. More often than the answer includes our family, our friends, our good (if it is good) health, perhaps a special possession or two. After a week or more of evacuations, fire, and loss, many here are incredibly grateful to God, and to the firefighters and other first responders who risked their lives on our behalf. Everywhere you look, there are signs of thanksgiving. I mean that literally. At its peak, the fire was fought by strike teams from all over the country. 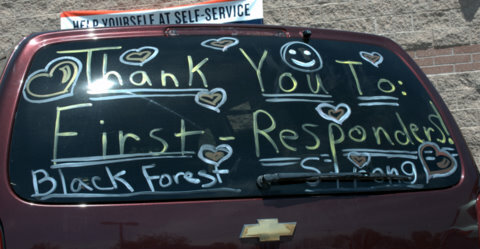 Many of the firefighters told reporters that they’d never before experienced such an outpouring of love and appreciation. Our sheriff (who did an outstanding job during the crisis) said he’d been hugged more in the past two weeks than in his entire career. We too are incredibly grateful, first that we were able to evacuate safely. Knowing the cat and gecko were both safe also ranks high on the list. I’m so glad my chickens survived their ordeal. Virginia, whoever you are, thank you for feeding and watering my hens. I wish I could give you a big hug and a carton of fresh eggs! 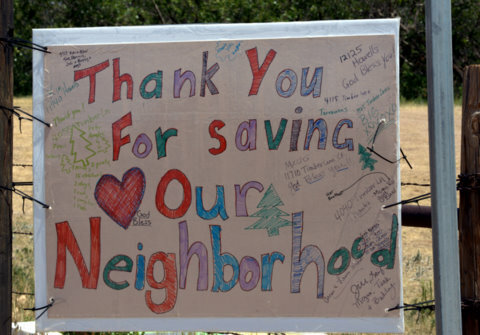 We appreciate everyone who worked together to stop the fires and save homes. There’s nothing like coming home to an undamaged house surrounded by healthy trees and a green field, after facing the very real possibility of losing it all. Then there are the smaller things that add to our thanksgiving. For example, I’m extra thankful for utilities—electricity, water, gas. When a couple of guys from Black Hills Energy showed up on Wednesday to turn the gas back on, I was thrilled. Thank you, God, for hot showers! We tend to take our utilities for granted—until they stop. Then we’re reminded of the many people around the world who live without even clean water. Changes of clothes are another luxury we usually take for granted. Since I was focused on saving things like the back-up drive for my computer, the batik we bought in India, and the piles of receipts for our as-yet-unfiled 2012 taxes, I almost forgot to grab even one change of clothes for either of us. As a result, we ended up wearing the same outfits several days in a row. I’m not big on fashion, but it did feel a bit odd to show up to church in flip-flops and my grubby old denim capris. While our hosts encouraged us to use their kitchen, I found it very difficult to prepare any sort of meal there. For one, I was always hunting for pans, whisks, bowls, and other implements. Then there was the matter of ingredients. I would go to the market to pick up something for dinner, then start cooking only to realize that some item was missing. For example, I made a salad, but when I went to dress it, I realized that the only vinegar on hand was cider vinegar—and I’m allergic to apples. Now that we’re home again, I find myself appreciating the ingredients I keep on hand. Not everyone has access to, or can afford to buy, the variety of seasonings and staples that make cooking fun and the results so tasty. As I began to compile this list, I was surprised by what came to mind. The things I appreciate now aren’t what I would have thought of a month ago. For us, the fire and evacuation has clarified what we truly hold to be important… and for the most part, it’s not the heirlooms stuffed in our closets. Who would have guessed? I’d like to suggest a little exercise for you. Put yourself in the position I was in last week. What items would you save in the event of a fire? Limit your list to what you can grab in 45 minutes, and they must all fit in your car. Now, imagine living for the next week or two with only those items, plus the hospitality of kind friends. Bonus points: what if you had to evacuate to a Red Cross shelter instead of a friend’s house? More bonus points: what if you can’t afford to go to Walmart to replace things you forgot to pack? 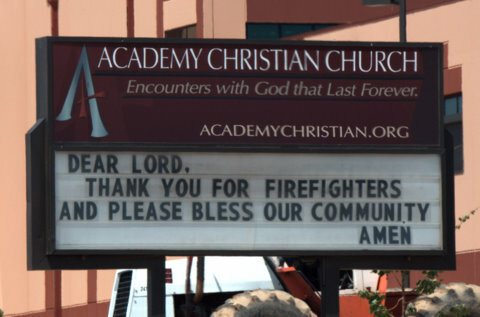 This entry was posted in Faith & God, Lessons Learned and tagged appreciate, appreciation, Black Forest, Colorado, fire, firefighters, first responders, grateful, gratitude, thankful, Thanksgiving. Bookmark the permalink.